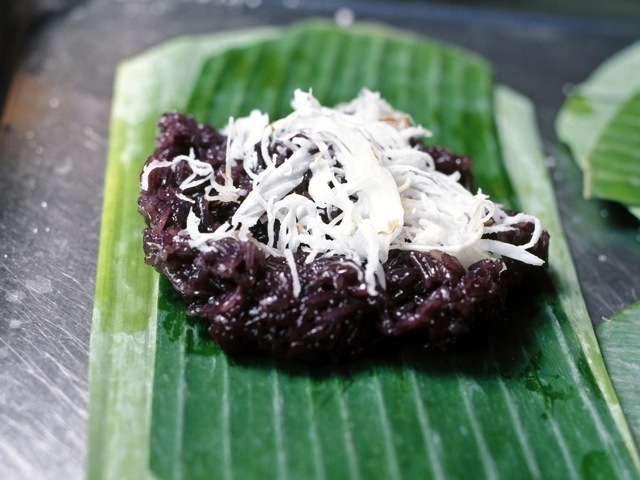 Black sticky rice can be purchased in Asian supermarkets, specialty food markets, and online. The grain is long, unlike the short white or brown Japanese rice used for making sushi rice. This dessert is a rare treat not only because it tastes marvelous, but also because the black coating on the rice is the bran, which is very nutritious. Soak the black and white sticky rices together in cool water to cover overnight. Drain. Transfer the rice to a steamer basket lined with softened dried or fresh corn husks or a double thickness of cheesecloth. Fill the steamer pot halfway full with water. Bring to a boil. Insert the steamer basket with the rice, cover, and steam over high heat until tender, 30 to 45 minutes. Check the water level at regular intervals and replenish with boiling water as needed. Keep warm. In the meantime, heat the coconut cream and milk, ⅔ cup of the sugar, ¼ teaspoon of the salt, and the nutmeg in a medium saucepan over medium-low heat. When the mixture begins to boil, remove from the heat. To make the coconut syrup, combine the coconut cream with the remaining ⅓ cup sugar, ¼ teaspoon salt, and the rice flour in a small saucepan. Stir to mix well and cook over medium-low heat, stirring constantly, until the mixture thickens, about 5 minutes. Do not boil, or the coconut cream will curdle. Set aside to cool. (If making ahead, cool completely, then refrigerate for up to a week. When ready to serve, microwave for 10 to 20 seconds to warm.) To assemble, pour a ladle of warm coconut syrup over each portion. Serve with the fruit slices on the side.